Modern features, killer tone, and loads of fun at an unbelievable price! Aimed at guitarists from beginner to weekend warrior, the Fender Mustang II combo amp contains highly accurate amp modeling, a stellar collection of effects courtesy of an all-new DSP platform, and many hidden capabilities, yet it's easy to use right out of the box! The all-new design is visually striking yet evocative of classic Fender styling. 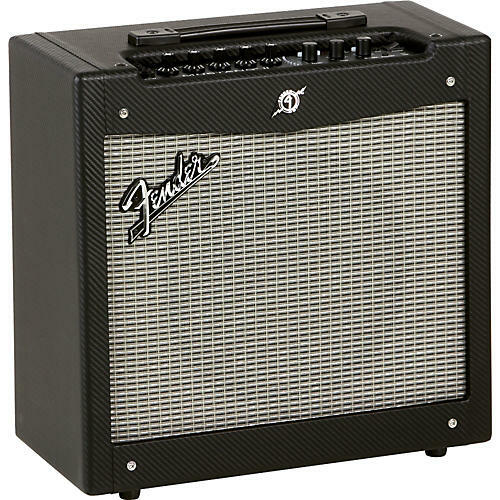 The Fender Mustang II has got a loud, lightweight 40W power amp design and a muscular 12" Fender Special Design speaker in its solidly built cabinet, so it sounds as good as it looks. The Mustang II combo comes factory-loaded with 24 presets built from 8 amp models and 24 effects, with tones from vintage Fender to modern metal. The number of amp models can be increased with its USB connection and the included Fender Fuse software, letting you completely reconfigure the amp any way you see fit. The USB connection also serves as a high-quality, low-latency audio output, making it easy to lay down tracks to the included Ableton Live Lite 8 Fender Edition software a breeze. Also included is IK Multimedia's Amplitube Fender LE software. The Fender Fuse software opens up a world of possibilities, including on-screen parameter control, deep editing, "hidden" effects, unlimited preset storage, online preset swapping with the Fender FUSE community, and free Fender artist presets. Great sound, endless experimentation, and a fun experience for guitarists of all skill levels. Order now!